For the past six months I have found and followed blogs of wonderful artists who are very organized--a real learning experience. During the past week most have posted their resolutions. After reading and thinking about so many great plans I have no idea which end is up. As is my custom, I will prepare my Mark Bittman (the Minimalist) black-eyed pea and collard greens soup, eat it on New Year's Day, and hope for luck. This torso was lying in the street five years ago. My friend Lamar helped me load it into my car; then we hid it behind my workshop. 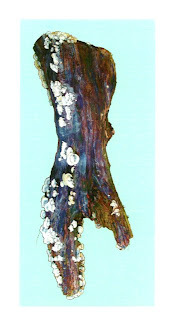 The fungi was beautiful; I made three trips up the ladder with the camera; then stitched the photos together. When she was wormy I walked her to the woods in back; she returned to the earth. Two friends passed away during this Season--one was buried on the 16th and the other on Christmas Eve; I had known them since childhood. Parties, decorations. and gifts are nice but friends, families, and memories keep you warm. I made it though my annual chaotic breakfast (egg-making is now assigned to a friend) and am looking forward to the new year. 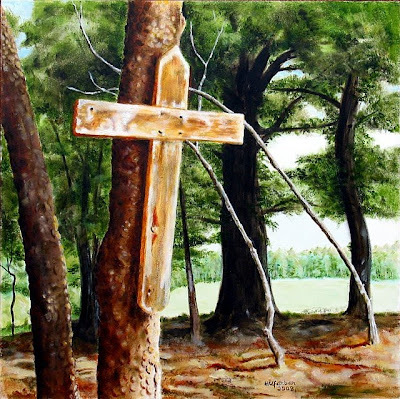 This painting from 2008 is a scene from nearby Cedar Grove Plantation. My art group was impressed with the beautiful house; I've always loved being alone in the woods. The sun touched the handmade cross while I was standing near the cemetery. A friend, who's from this area, bought the painting and told me she treasures it--I am honored. Here in SOVA, we were fortunate--only about 2 inches of snow. 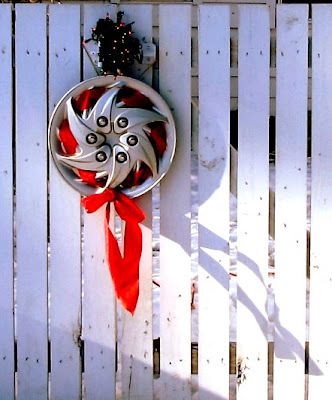 Today I hung my hubcap wreaths and found the extension cord for the bird bath heater. A sore throat and runny nose has put me further behind schedule than usual. Being sick gave me an excuse to take it easy and read a book. I chose A FINE DISREGARD--WHAT MAKES MODERN ART MODERN by Kirk Varnedoe, who was at MOMA--it had been on the bookshelf for two years. I was surprised to learn that many of the artists I like are considered modern--I don't know movements and isms. There was mention of a small book entitled Flatland by A. Square, which intrigues me. I have no talent for teaching so the ideas just enter my head and rattle around. It is a great book and, like all books, leads to more questions. I feel better; now I need to set up the guest house--my son will arrive Wednesday; clean and decorate the house (I am a minimalist); find and wrap the gifts I bought during the year; and prepare for the annual Christmas breakfast (my favorite was when I dropped the dozen uncooked scrambled eggs on the floor, the wall and on me). January may be my favorite month. Studying hieroglyphs from the back of the dictionary when I was young or looking at cave drawings--I've always loved symbols. Learning shorthand was no different; I was fascinated and sometimes created my own. And I was fast--my teacher even suggested I write a textbook. This is shorthand for Now Is the Time (at least, it's my way of writing it). I always thought it was beautiful. This wonderful brown linen mat with a white rectangle holding a Degas print was found at an auction for $8; the frame had obviously been removed. My plan was to take it apart and use it as a template. Instead, it became part of the art--I covered the print with modeling paste and gesso; then used acrylics and copper shavings for the painting. Some have seen a rabbit, some have seen a puppy, another saw a bong! I see a symbol--shorthand is probably a lost art. Now is the time for me to get moving for the Holidays. So far, I've done only one thing--ordered my fruitcake from the Monastery Bakery. Yes, fruitcake with lime jello is my favorite Christmas dessert! While others were shopping, diligently working on paintings, or decorating for the holidays, I was playing with a tangerine bag. It began several weeks ago when I didn't cut the bag into pieces (for animals' sake) and left it lying on the counter. At first, I thought it might make a nice hat--with that little tassel. It did; I looked a bit like an old elf and considered wearing it to holiday parties. I then noticed the similarity between frozen turkey breasts and heads. I thought it might be cool to take a photo of a head in the bag. The memory of a photo--Mussolini hanging upside down--brought gravity to mind. After several days I had a plan. I would wait until my husband was out of the house (explaining my project would have been impossible and I didn't want an audience). I chose a small Danish leather-topped table; I moved the dining table to make sure I had enough space, set up a light, set up the camera--a cereal box stood in for my head--and I lay across the table. Anatomy (and a couple of fused disks in my neck) made it impossible to get all of my chin below the table top. With my left hand holding the bag tightly behind my head, I snapped the shutter with my right and waited in place for the timer. In some photos I forgot to remove my glasses (they were hanging on my forehead); in some I inadvertently used the flash (I wanted shadows); in some I am without the bag (I look like a gray-haired Dracula); and in others I am laughing too heartily. I chose a photo and with Corel Photo/Paint was able to remove my arms and the table legs, clone my missing chin, enhance the turkey-look of the skin, and add the carrying strap. I think the contraption on the right represents a scale--$2 per lb. 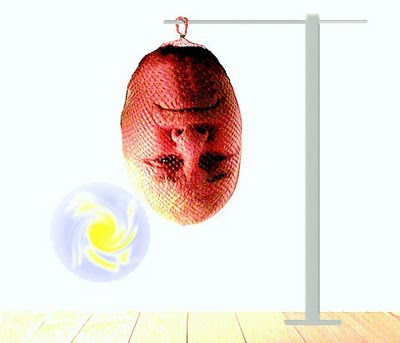 Lesson learned: If you're in your sixties and want to hang upside down, a net bag is handy for holding face parts in place. Gravity is awesome. I am usually very serious when working on a painting. Playing with digital photos is just great fun; I don't think of it as art but as "arting around." I'm still looking for a model. Expression has been a recent topic in blogs that I follow: Kathy's and Margaret's --and I pay careful attention to Don's insightful comments on those sites; he has a great self-portrait on his blog and his Thanksgiving entry was powerful. 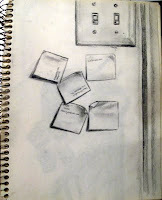 Margaret's entry from yesterday asked if we could identify when we found our artistic voice. I found mine easily when I was in my twenties but it was with sculpture. 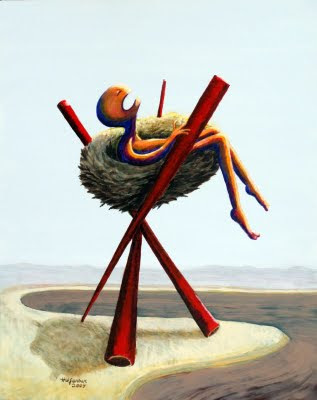 In 2001, after 35 years of sculpting, I switched to painting. For some reason I felt that I needed to paint because I could no longer express myself with sculpture, such a slow process--whether clay, wood, or stone. I've since learned that painting (my painting, anyway) is not necessarily faster. Getting the nod of approval was important when I began painting so I chose my subjects carefully and stayed close to realism. 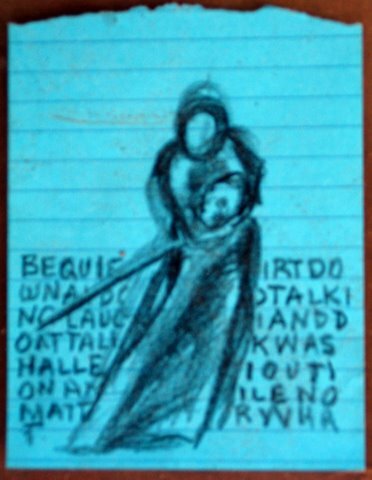 In 2006, I awoke from a dream and made a sketch. In the dream I had unearthed and retrieved something important and a bit gross. I interpreted the dream as a message--don't shy away from the strange. (Yes, people--for many years I kept a dream diary--great fun-- & have actually tried programming my dreams. It sometimes works.) I also acknowledge the book "Women Who Run with the Wolves," which says we often leave our wild side behind in order to conform. (To Heck with that!) I felt this painting was my announcement that I would take more chances with my work. I am fortunate--I have good friends and family who enjoy and buy art; they provide approval and support. They don't necessarily like everything I paint but they see it as progress. 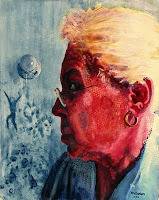 Close friends who are neighbors bought this painting at my summer show; I visit it often. Lots of my paintings have not made it off my street! I celebrated Thanksgiving on Scuppernong Hill with my brother, my sister-in-law, and with friends who have become family. A sunny November day, great food, good people--for this I am thankful. This was last night's attempt at the 20-minute challenge. 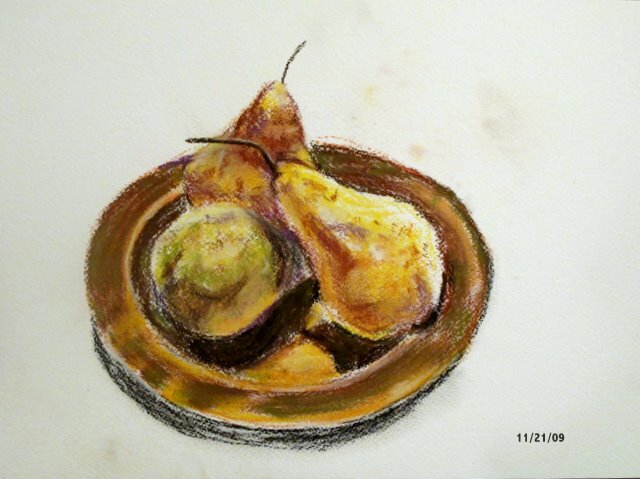 Now experienced, I limited myself to five items--three pears, a copper plate, and a woven leather place mat; I set them under a single overhead light and chose conte pastel pencils because the colors are easy to identify. Using the microwave timer (no ticking) very little was recognizable at 20 minutes. I kept going--for a total of 45 minutes, even with the elimination of the place mat! I will try the challenge again and I almost have a plan: I'll stick with the pastel pencils and tackle maybe one lemon on a white paper plate (no reflections). Speedy is not my nickname but this is fun. I was upset not at paying a high water bill, but, at the unfairness of life. For a month I could not go into my workshop and face this painting without tears. 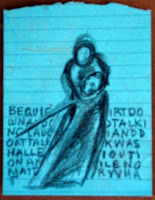 I stayed in the house and worked with pastels or drew with pencils; I sent a small contribution to help Kenya. Yesterday I got back to the painting and finished today. Each night I ask that rain be sent to that area, and this painting will always remind me of thirsty people, livestock, and elephants. I usually stick with humor--I couldn't find it this time. It began as a calla from a photograph--I ditched the photo. After looking at hundreds of calla images of all colors on Google, I went with my imagination. Why not? 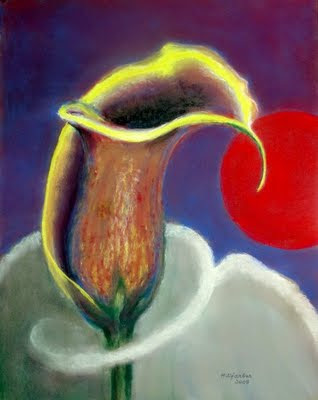 My book on using pastels is in hiding; reviewing might have helped--this is my second pastel work and it's on Ampersand pastel panel. I worry that if I sneeze this painting will disappear. Do your eyes go directly to that red sphere? Thanks to today's entry "Balance: Weight and Direction" on Kathy's blog, I now know the reason--actually, several reasons. My thinking was much simpler: "Hmm......I think I'll use that red pastel and make Mars." 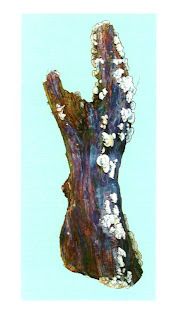 I follow the exceptional blog of Katharine A. Cartwright, a wonderful artist who is unbelievably organized. 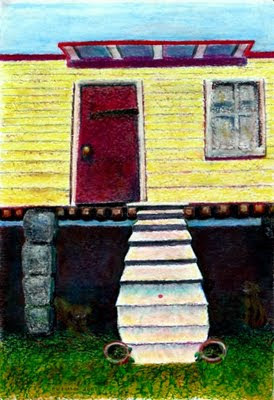 A recent entry explained her "twenty minute challenge"--in twenty minutes, she paints her surroundings. Among other things, these small paintings have provided a record of her travels when she's teaching. Many of her readers found the concept interesting so she has set up a "Twenty Minute Challenge" blog. Since I've always drawn my environment (and there's no requirement to work daily, to travel, or to venture outside), I may join. Stopping after twenty minutes will be my challenge. Information on The Challenge is here. Drawing with a No. 2 pencil is one of my favorite things. Supplies are stashed everyplace--even in my tiny bathroom tucked under the eaves. A small desk was a perfect fit in the strange corner under the low ceiling (HGTV designers haven't thought of this yet). The post-its? Left: "bathroom art." Right: web addresses for Holbein, RI School of Design, a street address for Good Will in Danville, the name of a woman who makes good pies, and one written in invisible ink. I consider the upstairs loft truly "a room of my own." 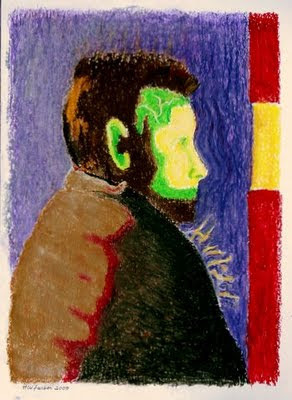 I have been following Van Gogh's blog; a wonderful site that contains his letters and drawings. His Bedroom paintings, with the strange corners and slightly skewed furniture, have always made me smile. We should enjoy our surroundings and be grateful. I'm learning to use my new camera--actually reading the manual! 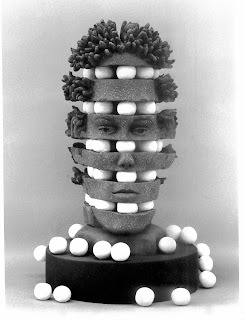 From my sculpting days, Marbles Lost, Marshmallows Retained, ca. 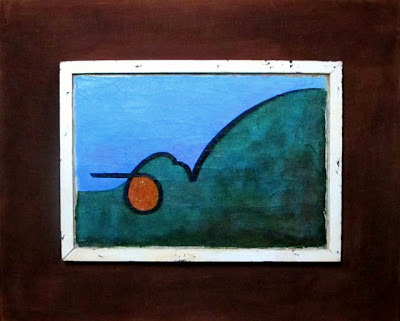 1990, sold to a couple from Germany--they saw it in the D.C. gallery. 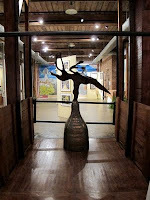 When a visitor at the Montpelier Cultural Arts Center in MD walked past my resident studio and saw the sliced head on my sculpture stand, he was not sure he wanted to meet the artist. My copy of this book by Alyson B. Stanfield arrived in March; I read it and ordered more copies for friends. 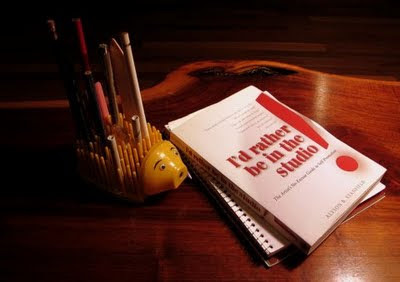 This book is the reason I seemed almost organized at my art exhibits--invitations were mailed on time; my short artist's statement and business cards were on hand; there was even a guest book for visitors; I spoke to groups. Names and addresses are now close to being in a folder which will one day become data in my computer, and thank-you notes were sent. Until I read the book, blogging was just an often-heard word. 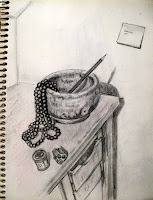 Now I blog--I follow other blogs (and not just art blogs). Following blogs and the stock market is almost a full-time job. Thanks to one of the suggestions in "I'd rather be in the studio," I actually left the comfort of home and looked at art last week. 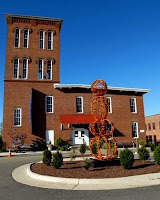 The Parsons-Bruce Art Association sets up an annual art exhibit at The Prizery, an historic tobacco warehouse, in South Boston VA--two floors of beautiful work by many talented artists. I am grateful that I found this book. I considered mentioning it in an earlier blog but I only recently learned how to highlight words and add links. Hooray for old dogs learning new tricks! 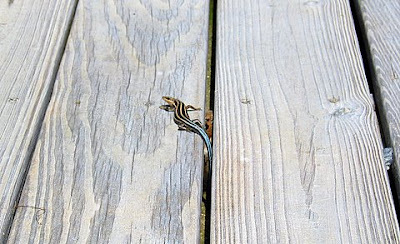 The blue-tailed lizards (skinks) are abundant in southern Virginia--they like living under my back deck. I miss them during the winter. "All clear; I think I'll catch some rays." 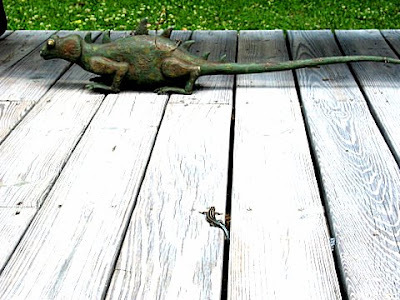 If you see lizards you don't have black snakes--and if you see black snakes you don't have moccasins. I am happy when I see skinks! 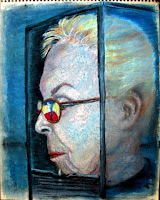 The Seer, oil pastel, 18x12, came from many parts of my brain, piles of magazines, and a big box of oil pastels. For several weeks I have been looking through ten years of Art in America, cutting out photographs of paintings I admire--my choice was cut them up or be buried under them. 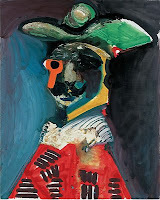 I came across an intriguing 1970 painting by Picasso, Buste, from his Mosqueteros (Musketeers) and thought of the fun he must have had while painting--this might be my favorite Picasso work. It reminded me that art does not always have to be a serious undertaking; playing is a good way to learn. The Seer began with a Time photograph of a soldier peering into a huge night vision machine. My work looks nothing like the photograph; I spent about 20 minutes looking at it, then closed the magazine--I remembered the green at the edge of the face. My Seer looks a bit like the X Files actor, and he has the bulging forehead vein I saw on a doctor's temple last month. When the Aztec appeared on his back, the Seer's hairstyle was changed to match. Is he looking into the future? I have no idea--the painting needed a vertical and something red. The Seer looks nothing like the psychic my friend and I visited once a year--Mr. Whiz of G Street in Washington, D.C. He never peered into anything, sparks never came from his chest, and his predictions never made much sense. We visited other psychics, laughed, and swore we'd never spend another dime on something so stupid--but we did. My friend now thinks she's a psychic and was offended when her local police department declined her help in a murder case. 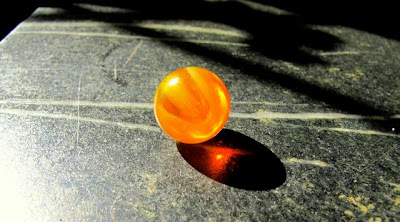 I enjoy my off-plumb friends; they make me feel at home. 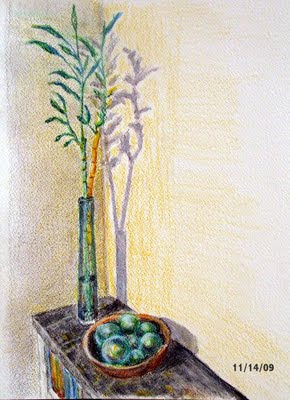 All these thoughts surfaced as I played with my beautiful wood box of 120 crayons (Sennelier oil pastels). Next week I hope to be using a new camera, a Canon G11, and I'll post a better photo--the G2 has served me well. At shows, the most frequently asked question is "Where do you get these ideas?" 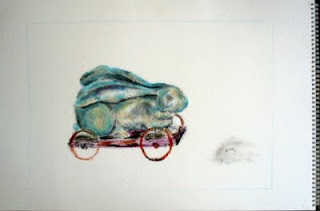 For On Track, oil pastel, 18x24, there was no plan. 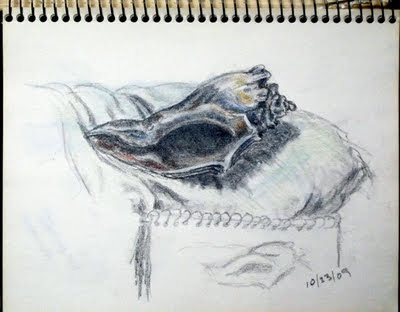 When I was running late for my Art Group at the Y, I grabbed this rabbit from his perch--he'd been sitting on a backyard fence for nine years, watching the real bunnies who come out to play (usually on Friday evenings). I used a twig to remove the dirt dauber nest from his bottom, blew off the leaves, and put him in the car. The colors and lines came first; then the title; then the idea of racing or being pulled towards death--all those wheels at the bottom of the cliff. I don't think of the painting as dark, just a part of life. My mom (with that Southern humor) said, "People are dying today who've never died before." Who can argue with that? I sometimes enjoy surprise endings. Tonight there was a celebration of regional artists--an annual Community Memorial Healthcenter Hospice Event. Six artists were featured: Shelly Hudson-Baker, Trey Eppes, Karolyn Hawthorne, Wayne Herrman, Debbie Vaughan, and Pam Wilkinson. 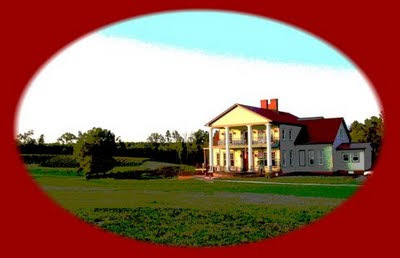 The event was hosted by the 450-acre Rosemont Vineyard & Winery in LaCrosse VA. I was invited by Friend A who said, "We will all need Hospice one day." She's right. Since the vineyard is off the main roads, I printed a Google map and was confident until Friend B stopped by--she lives near the vineyard. She said, "That's the long way--take Route l, then Red Lawn, then 903, etc." I printed another map (which included a crooked Nellie Jones Road). These are narrow roads with beautiful scenes of pines, rolls of hay and tobacco fields--sometimes deer. After several U-turns and much laughter we arrived at Rosemont (36 miles = 65 minutes). I took the above photo from the parking lot--then posterized it. For the return trip I selected "Take me home" on the GPS--it was the long way but required only one U-turn. I visited the website when I returned and looked at Rosemont's directions--the correct route is very simple. My route was memorable. During walks on my side of town, Willie waters all the mailbox posts and I check out the neighborhood--there are space-ship shaped mushrooms, an occasional snake, and weird-looking bugs. I have watched a neighbor's weed grow all summer--it's off the front porch and has reached roof height. One tall, arty-looking weed in a beautiful yard--it must be a statement. Maybe it says "I almost conform." From the street, the weed is beautifully framed by a hanging pine bough--today I used my camera. I don't know the name of the weed--the bottom leaves are at least 12 inches wide and they have great veins. 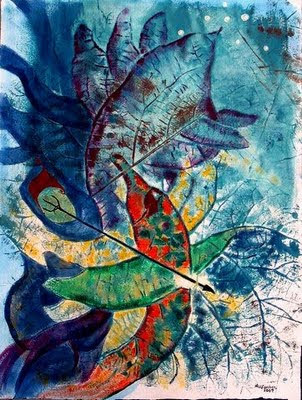 Several years ago I used some leaves to print onto watercolor paper; then I painted with acrylics. I named it Turmoil, 28x20. 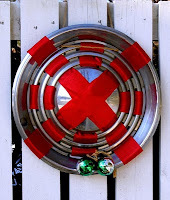 It's nice living on the arty side--neighbors liked my red-ribboned hubcaps posing as Christmas wreaths, and no one has mentioned our missing shutter (it's behind the holly bushes, and those things attack). 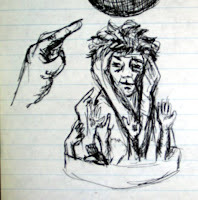 A very early sketch from my sculpting days--the 70's suburban mother-wife-Fed employee-sculptor with the station wagon. Looking in the mirror, ca 2001. Put your chin right there (after an ophthalmologist appointment) 2002. 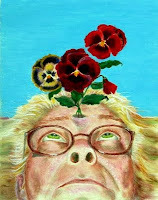 Pineal Pansies, Bane of Astro-travel, (from a Polaroid shot up my nose) 2003. Rage--I'm hanging myself but holding a barbed-wire whip, 2004. Faux Orchid--I sat in front of a mirror for hours (living in an apartment while our house was being renovated--nine months with no digital camera available) 2005. 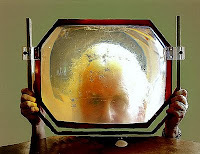 Eye on the table--a manipulated digital photo with my new toy (a magnifier used to enlarge early TV screens) 2007. 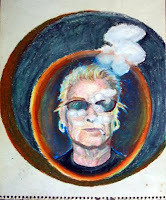 Ideating (a "yield" or "slow" sign appeared on my cheek; I left it) photo from 2007, painted in 2009. In person I appear normal in my well-worn, paint-spattered denim shirts--boring! The next self portrait? I think I'll be looking at a map of heaven and hell--contemplating future travel. I hope to finish the painting before I make the trip (sometimes it's years between planning a painting and actuallly getting it done). 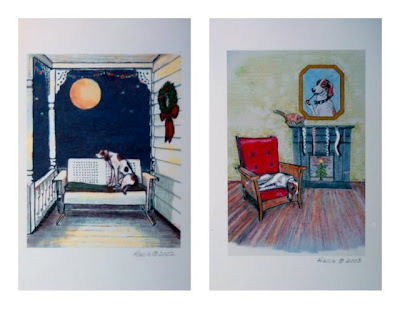 The Holly Springs art exhibit was taken down on Monday and I returned my favorite drawing to its owner--a neighbor who has bought three of my works. 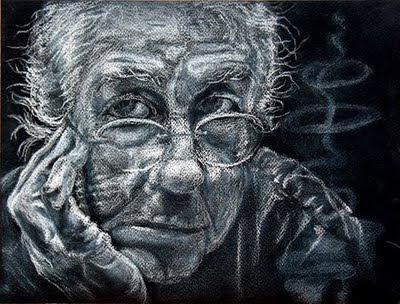 Nose to the Lens, white conte on black paper, is sort of a self-portrait; I would not do this to anyone else. I set the camera on the kitchen windowsill, leaned on the counter (my favorite bird-watching stance) and put my nose to the lens--in the sunlight! Every wrinkle is high-lighted and I added some for good measure; the eyes are not quite aligned as they watch, the nose bulbous, the eyebrows extra-long, the hair fly-away. I took many liberties and totally enjoyed doing this. I also made a discovery. As I looked over my glasses at one of the stray strands of my colorless hair (used to be a redhead) I realized that, in sunlight, each strand contains the whole spectrum. The colors run across the hair--not up and down the strand! Amazing! Why didn't I know that? What happens to all the things I've learned when I die? Is there a giant data base someplace? 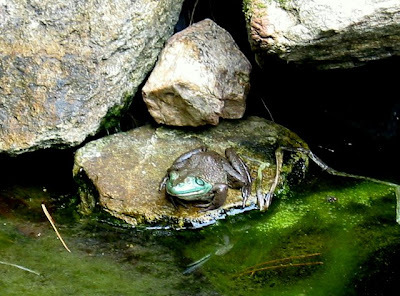 What other amazing things are right under our noses--if we just take the time to look? Hunting is popular here in southern Virginia and many hunters take great care of their dogs. Some, however, leave their dogs behind when the season is over; some dogs who don't perform well or are injured are simply abandoned. That's how I found Elvis--or Elvis found me. 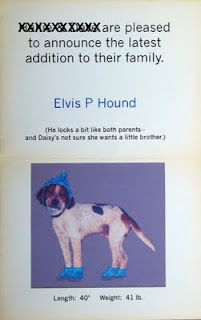 In 1999 there was no local SPCA and no leash law when I saw Elvis limping down our main street. When he showed up on my side of town, I offered a piece of chicken and a front porch glider with a blanket--he shyly accepted. When my neighbor (who has since moved) said she was calling the dog catcher, I adopted him, sent out announcements, took him to the vet for shots (the limp was due to a broken leg that had not been set), bought a collar and tags, and had him neutered. Our bichon, Daisy, reluctantly accepted him. Elvis provided us with great stories. During the following year or so, he sang at the back door for his food, learned to retrieve a ball (not run from it), unlearned some of his survival skills, slept next to the bed (he had a terrible gas problem), claimed the Morris chair, rolled in fish guts, enjoyed rides in my old Cherokee so much he wanted to ride in everyone's car or get aboard their boat. When the neighbor who threatened to call the dog catcher opened the door to her new Mercedes to show off the interior, Elvis checked it out. He had ear infections, came home with the skin scraped from the pads of his feet, stole Halloween decorations, de-tasseled my husband's loafers, jumped into open car windows to nap on back seats, and had a positive reading on his heartworm test. (A definitive test was negative.) The alpha dogs bullied him, the neighbor's cats made him scream with terror, and he needed space to run--when he ran, he was beautiful; when he walked, he was stiff-legged and very slow. 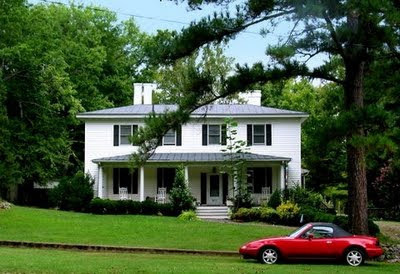 Kind-hearted neighbors who had recently moved to the country adopted him; Elvis rode in my '87 Cherokee to his new home in an adjoining county (a sad trip for me). For seven years he and his buddy, Corky (a beagle with a bad leg), enjoyed an idyllic life on about forty acres. I got reports on his well-being and visited several times. On Saturday Elvis did not come home. On Sunday his family found him under the back deck; they saw a wound on his right hind leg and thought it was a snake bite. The vet said it was a .22; someone shot Elvis and the bullet shattered the bone. He is on antibiotics. If he makes it, his running days are over--he is probably close to ten years old. I don't believe we'll ever know why he was shot or by whom. I do believe that, if God does not forget one of his sparrows, He surely knows what happens to His hounds. We now have an SPCA; Elvis was my model for the Christmas cards above (2002 & 2003). I drew them, printed them, and sold them--all money went to the SPCA; I put him on their first T shirt design and he's still on their letterhead. The Lake Country SPCA has dedicated volunteers and little money; many dogs (not all are hunting dogs) and cats are waiting for adoption. 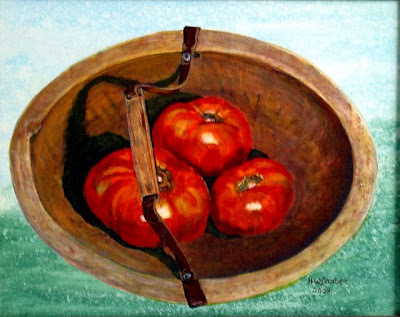 I borrowed this painting, Jabor's Tomatoes, acrylic 11x14, from the owners; it's hanging at the Holly Springs NC Cultural Center exhibit. 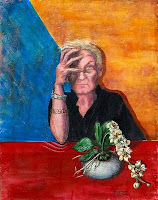 The Art After Dark reception is Friday 6 to 8 p.m.; the exhibit will hang until the end of August. In 2004/2005 our house was gutted and remodeled--from the dirt to the rafters. 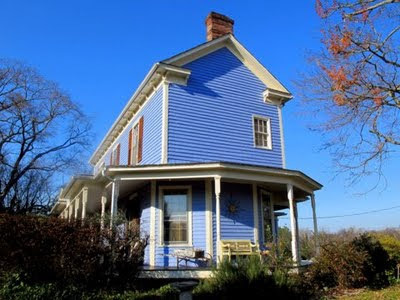 My husband stayed in our tiny guest house; I rented an apartment up the street and furnished it sparsely--two Morris chairs in the living room held my files; and, in the kitchen, I had a desk, one folding outdoor teak chair, a daylight lamp and a used three-foot tall step ladder (for changing bulbs). There was no TV and the cell phone was used infrequently--calls were too expensive at the time. 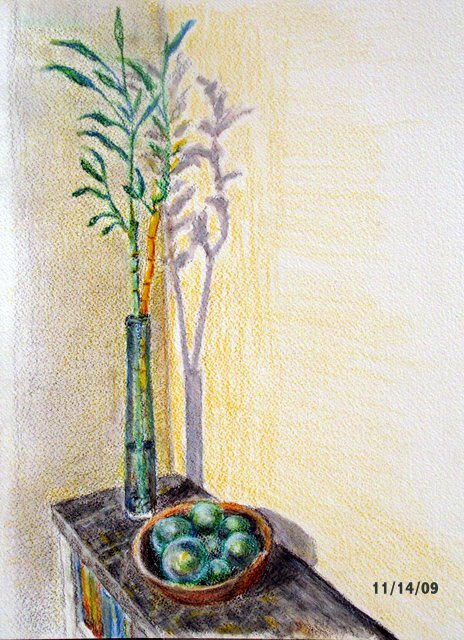 I placed three tomatoes (from a friend's garden) in a 75-cent leather-handled wooden bowl, set it on the chair, set up the lighting, put my palette on the desk and I sat atop the ladder--all night! I painted from 10 p.m. to 8 a.m., took a nap, and resumed painting. I completed it in about 24 hours; I relish the memory. The bowl went with the painting (I insisted); when I saw it last it was filled with clementines--what a nice painting that would make. For years I had a recurring dream of climbing and climbing; access to the next level was always blocked--by a locked gate or a door. 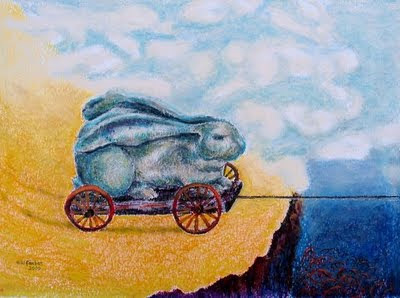 This depicts one of those dreams--I am here.....often, oil pastel, 18x12. In this dream, upon reaching the landing, there is no way to open the door without knocking myself off. The "you-are-here" red dot on the stairs represents me. From there the perspective is of looking up at the roof--or looking down at the flowerpots; reaching for the knob left handprints on the door. I have not had the dream since I finished the painting. 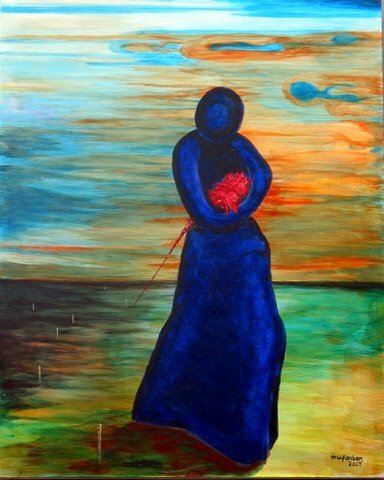 I don't think the painting was the cure; I believe that by ignoring non-essentials--everyday housework, gardening (weeds are okay), etc.--art became a priority in my life and doors opened. It took many years to make this choice; now I claim my art time each day. Occasionally, the house gets cleaned and weeds get pulled. This painting is part of my exhibit at the Holly Springs NC Cultural Center August 3 to 31. Today our Congressman, Democrat Tom Perriello, visited MacCallum More Museum and Gardens in Chase City VA. I showed up at 2:30 and learned that the Congressman had arrived early and had already toured the museum and my art exhibit--he actually signed the guest book. I had met him when he was campaigning but did not see him today. I talked with some interesting people walking through the exhibit--tomorrow it will come down. Perhaps one of my planets is in retrograde because I did not see my favorite friend at the Gardens today, either. I have checked on this little guy for two months--he's not blind, he's changing colors. Last week, most of the green had disappeared. I heard him today but there was no photo op--maybe he's not a Democrat. Several years ago I planned to sit under the apple tree and paint a branch laden with fruit--I changed my mind when I actually walked under the tree. 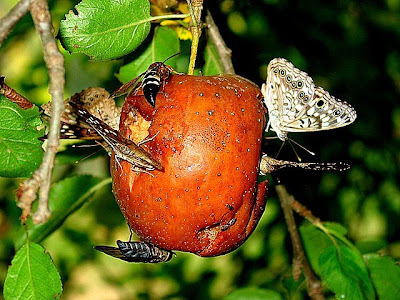 I had seen squirrels scurrying up trees with apples and birds pecking at them on the ground; I had forgotten about insects. 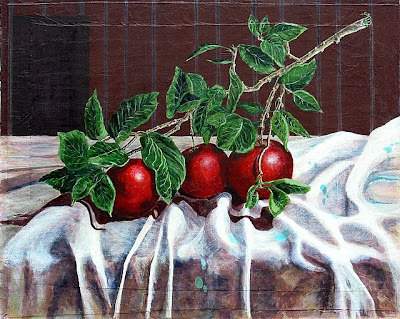 My en plein aire painting became an en-workshop broken branch painting--Apples on a Dropcloth, acrylic on linen/duck/canvas, 24x30--a neighbor bought it. Always wait for these apples to turn red before eating (I learned through experience).